Beautiful. I love old holy cards. Breathtakingly beautiful and the music, too. I enlarged the photo but can't quite make out the words? Protectoress? welcome to our gathering of marys! 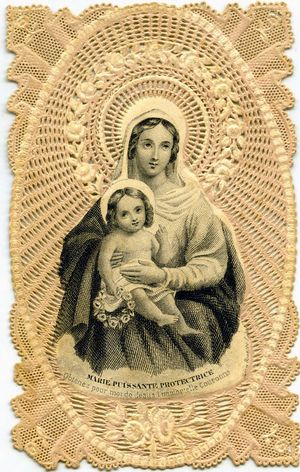 so lovely you vintage white prayer card, like an irresistible valentine to the divine! I am drooling over this Holy Card. It is the best I have ever seen!!! Well I don't think that I have ever seen a card this old or one in sepia tone. It is marvelous, truly. I love it. I am amazed because I went to Catholic school and never saw anything like this. Great! What an exquisite prayer card! That card is beautiful, so fragile looking. Thank you all for your kind comments. This prayer card is paper. I believe the word is "Protectrice"